As the weather gets warm I am starting to crave fresh and light food even more than before! When I lived in Genoa, Italy, I was crazy for their famous pesto alla Genovese. The fresh pesto you can find there can not be compared to the pesto you buy in the shops. The secret to their pesto is the fresh basil they use – and they use lots of it! Herbs are often neglected when it comes to nutrition and healthy foods, but they contain so many nutrients that it would be wrong to use them just as plate decoration. Integrate them in every meal and you will give yourself a healthy dose of important minerals and vitamins. Basil for example is rich in vitamin A, K, C and minerals such as magnesium, iron, potassium and calcium. It can help reduce inflammation and swelling, and because of its high content of antioxidants it is said to have anti-aging properties. I have to admit that when I stopped consuming cheese the hardest one for me to give up was Parmesan. I substituted it for a while with goat’s Pecorino cheese, but soon after I completely stopped consuming any type of cheese. As you know the original recipe for this pesto calls for cheese. I didn’t want to give up the pleasure of fresh pesto alla Genovese and this vegan recipe actually brings it pretty close to the original. I substituted the cheese for almonds. When blended they give that nice creamy and substantial texture that you expect from pesto alla Genovese. I also add parsley to it for a more versatile flavour. Parsley is very high in vitamin K, as well as vitamin C and A. It can help with cancer prevention and improve bone health. People who are taking blood-thinners should be conscious of their consumption of parsley as vitamin K plays an important role in blood clotting. You can use a mortar and pestle to make the pesto, or if you are impatient to eat it (like me) you can go quicker with a food processor. 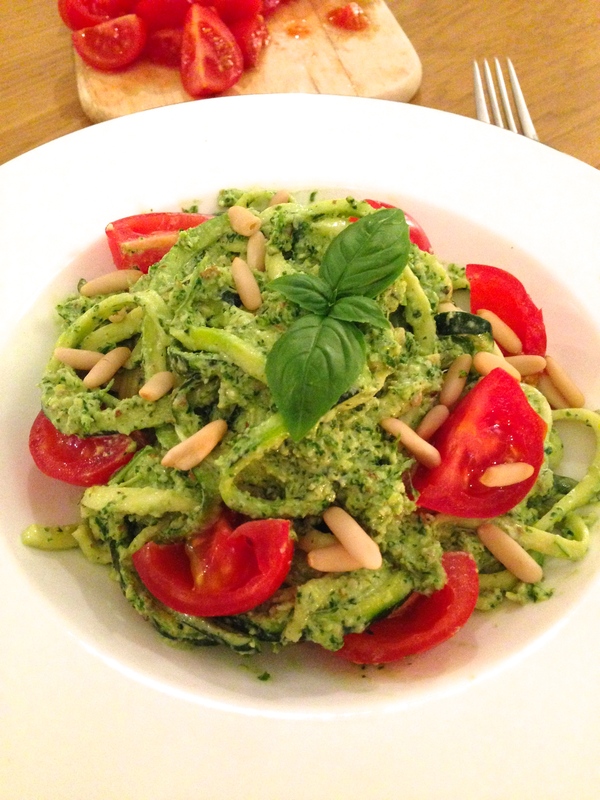 I also substitute the pasta for zucchini noodles, they just make the dish even fresher and taste great with this pesto! You can, of course, use normal pasta. Use the spiralizer to make your zucchini pasta. If the raw zucchini taste bitter for you, you can also put them in boiling water for 1-2 minutes. This will soften your zucchini pasta further. Do not throw away any zucchini leftovers after you have made your pasta, but place them in the blender with the rest of the pesto ingredients. The water in the zucchini will make the pesto creamier. Combine all ingredients for your pesto (except the olive oil) with the zucchini left overs in the food processor or blender. Blend well until you have a homogeneous and creamy texture. Slowly add the olive oil to the pesto and mix well. 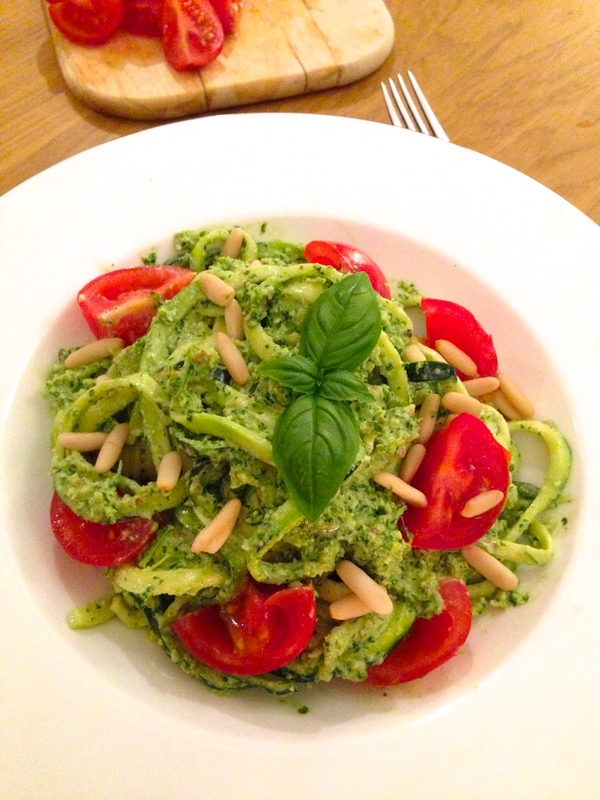 Mix the ready pesto with your zucchini noodles and top up with some sliced cherry tomatoes and pine nuts .